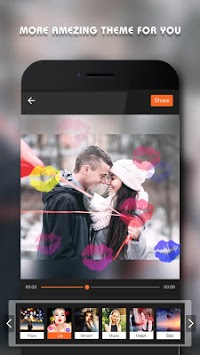 📌🎥Beauty Video is the best video editor and completely free, offering video clipping and trimming, fantasy filters, free music and movie effects to help you make videos to upload to social networking sites like YouTube, Instagram, Facebook, etc. 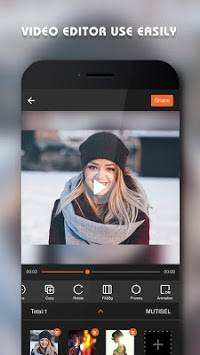 📌🎥Beauty Video is a free and professional video editor. You can express yourself in a variety of ways. You can easily edit videos, make photo movies and video stories , share them with your friends and family, and turn everyday moments into the themes of the art work you want! 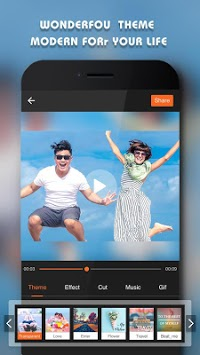 📌🎥With Beauty Video, you can easily edit video、make photo movie video story and share with your friends & family, transforming everyday moments into works of art as you want and let the world discover them! 🌈- Theme: 20 + different style theme templates, beautiful / lovely / cool / mysterious and so on different styles, lazy operation, you can make the video become delicate and unique! 🌈- Effect: You can add a variety of dynamic animations to your photos or videos, and you can adjust the position and length of each effect on the video! Very interesting and cool! 🌈- Filter: add different filters for different scenes in the movie to enhance the quality of the movie. Unique filters make your videos like movies! 🌈- Free Music: Free music for different situations: dance, friendship, travel, sports, love, memories, etc. You can also choose and edit your native music. 🌈- Dynamic GIF: more than 100 kinds of dynamic GIF! There are all kinds of styles here. Add more fun and difference to video. 🌈- Beauty Sticker: Beauty video provide the 300+ stickers for you . Use emoticons, fun eyes and animal ears stickers to make you cute, cool and fun! Play your imagination and make vivid films! 🌈- Text: Simple animation, colorful bubbles, voice-over, striped hand-painted, illustration rich context subtitles, a variety of styles of fonts: hand-painted, bold, round, Song, etc., font shadow, alignment, multi-color edge drawing to meet all your needs! 🌈- Frame: the different border styles and various color settings make your video exquisite and amazing. 📌- Quickly and directly import photos into the local album, one click using the theme template, theme photo MV is generated directly, There are effect /music / gif/ sticker/ text/ filter/ frame, and can set different filters for each photo and different ways to switch photos! The function is very powerful, very easy to use! 📌Beauty Video is a free video editing app & professional video editor, our in-app purchases offer additional powerful capabilities for even better video storytelling experience.